To be a Bad Angel is to take your running seriously, while still knowing how to laugh at yourself and each other. You pine over negative splits and how to treat blisters, but you also discuss runners who annoy you and the occasional pooping of pants. That’s what running — and this blog — are all about: finding the perfect balance of serious and silly. If you can find that balance, then grab your wings, halo, devil horns and running shoes, because friend, you’re a Bad Angel now, too. Amie has always been a runner. Or at least it feels that way. She won her first trophy at age 6, and never looked back. 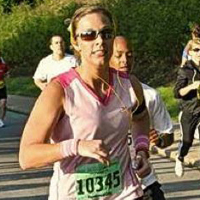 In 2001 she ran her first long-distance race, a 10K, and since then has completed 10 half marathons, seven full marathons and various other distances. 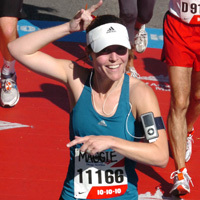 In 2009 she ran the Chicago Marathon and qualified for Boston. A lifelong goal finally realized, running Boston in 2011 proved to be the ultimate, retire-worthy race that she was looking for. Amie plans to continue running and competing, but in shorter (faster?) distances. A jock by trade, Adrea grew up in the gym. 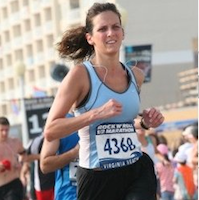 Two years of college soccer, three knee surgeries and two ankle reconstructions later, a doctor told Adrea her body was telling her to “slow down.” Instead, Adrea and her broken body trained for the Bix 7, and it was love at first race (added bonus: beating her old man). Now, running keeps her sane as she chases down her hubby (who passed her up a few marathons ago), pushes her daughters in a stroller and shuffles along with her trusty labradoodle running partner at her side. Maggie was not a born runner. She played team sports as a youth in Omaha, Neb. Soccer, softball, volleyball — you know, sports that consider running a form of punishment. It wasn’t until she spent a summer in Utica, N.Y., where running is the thing to do, that she started to catch the bug. She ran her first 5K (and won a trophy!) in 2002, but didn’t do another race until 2008. In 2009, Maggie joined the Bad Angels and began truly loving the sport. Five marathons, 10 half marathons and thousands of miles later, here she is.